Eggs are healthy foods filled with many different nutrients. However, egg yolks are rich in cholesterol, which some people may want to avoid if they're already consuming lots of cholesterol-rich foods. Eating just the egg whites, which have no cholesterol or fat, is healthy, as they are rich in protein and certain vitamins and minerals. According to the United States Department of Agriculture, chicken eggs can range between 1.25 ounces (35.5 grams) for the smallest eggs, known as peewee eggs, to 2.42 ounces (about 68.5 grams) for the largest eggs, jumbo eggs. One large egg is usually around 1.96 ounces (or 55.5 grams). Since eggshells make up approximately 11 percent of an egg's weight, the egg white and egg yolk in a large egg are approximately 50 grams. Out of these 50 grams, 58 percent is egg white and 31 percent is egg yolk. This means that most large eggs are made up of about 32 grams of egg white and 17 grams of egg yolk. Factors like the hen's age and breed can play a role in the ratio of egg white to egg yolk in chickens, but there is typically always more egg white than yolk. Another influencing factor is egg size — so peewee eggs and jumbo eggs from chickens can have different white-to-yolk ratios, and there will be obvious differences between the ratios in different sizes of eggs, like quail eggs, duck eggs and other types of bird eggs. Eggs are rich in nutrients like choline too, with 27 percent of the DV for this nutrient, and are good sources of omega fatty acids, lutein and zeaxanthin. Each egg also has small amounts (between 1 and 4 percent) of various other nutrients, including B-complex vitamins, vitamin E, calcium, copper, magnesium, manganese and potassium. There are minimal differences between whole raw eggs and hard-boiled eggs. 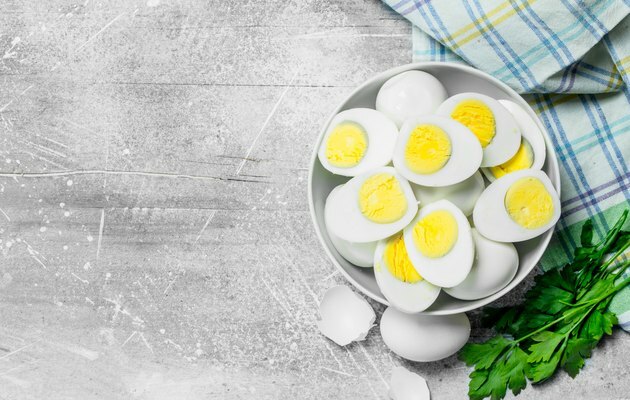 There is slightly more vitamin B12 (23 percent of the DV) in hard boiled eggs, but otherwise, the nutrients in hard boiled eggs and raw eggs are essentially the same. However, the nutrition in one whole large egg versus one large egg white is very different. Eating just the egg white from a large, hard-boiled egg will give you no fat, carbohydrates or cholesterol. However, egg whites do have 7 percent of the DV for protein. Egg whites do have 12 percent of the DV for selenium and 11 percent of the DV for vitamin B2 (riboflavin), though. They also have small amounts (between 1 and 4 percent) of B-complex vitamins, potassium, magnesium and copper. Of course, an egg's white is smaller than the whole egg: You're comparing about 32 grams to 50 grams. However, even taking this into account, there are almost none of these nutrients. This means that most of the nutrients in an egg are found in the egg yolk. If you're eating boiled egg whites rather than boiled whole eggs, there are some key differences. Eggs without yolks are a rarity. This means that when you eat one egg white, you're consuming quite a bit less than the whole egg . At 35.5 grams, one whole peewee egg is roughly the same size as the egg white found in a jumbo egg. Clearly, there are nutritional differences between whole, hard-boiled eggs and egg whites. Egg whites are really only good sources of protein, selenium and riboflavin (vitamin B2). Compared to whole, hard boiled eggs, though, they'll always have less of all of these nutrients. Unlike whole, hard boiled eggs, egg whites have no cholesterol or fat. This may make them appealing for people consuming low-fat diets, high-protein diets or those concerned about their cholesterol levels. There are no carbs in hard-boiled eggs or egg whites, so both are suitable for people consuming low-carbohydrate diets. Cholesterol has historically been seen as bad for you. Until recently, the Dietary Guidelines for Americans limited the amount of cholesterol you should eat to a maximum of 300 milligrams each day. As there are 186 milligrams of cholesterol in each large egg, people who ate eggs and other cholesterol-rich foods frequently needed to be very conscious of their cholesterol intake. The way around this problem was to avoid cholesterol-rich yolks and consume only egg whites. However, the updated Dietary Guidelines for Americans no longer restricts cholesterol intake. This means that most people don't need to be concerned about their dietary cholesterol, since the cholesterol in food doesn't seem to increase the body's blood cholesterol levels. If true, dietary cholesterol won't increase your risk for cardiovascular disease or associated problems, like high triglycerides or high cholesterol. However, research doesn't completely agree with these guidelines. According to a 2019 study in the Journal of the American Medical Association, large amounts of dietary cholesterol (more than 300 milligrams a day) may increase your risk of heart disease and death. Ultimately, given how nutritious egg yolks are, you should eat whole eggs, but in moderation. However, if you're concerned about the health of your heart or you like to eat eggs frequently, eating just egg whites is certainly a healthy, low-fat choice. Poultry Science: Effect of Egg Size and Strain and Age of Hens on the Solids Content of Chicken Eggs.